For courses in Human Physiology. 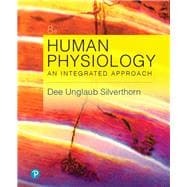 Human Physiology: An Integrated Approach is the #1 best-selling 1-semester human physiology text world-wide. The 8th Edition engages students in developing a deeper understanding of human physiology by guiding them to think critically and equipping them to solve real-world problems. Updates, such as new Try It activities and detailed teaching suggestions in the new Ready-to-Go Teaching Modules, help students learn and apply mapping skills, graphing skills, and data interpretation skills. The text reflects Dr. Silverthorn’s active learning style of instruction, and builds upon the thorough integration of “big picture” themes with up-to-date cellular and molecular physiology topics that have always been the foundation of her approach. Mastering A&P features new Interactive Physiology 2.0 tutorials, new Try It! Coaching Activities, and Phys in Action! Video Tutors, complementing Human Physiology and providing a cohesive learning experience for today’s learners. Mastering™ is the teaching and learning platform that empowers you to reach every student. By combining trusted author content with digital tools developed to engage students and emulate the office-hour experience, Mastering personalizes learning and improves results for each student. Features in the text are supported by Mastering A&P assignments, including new Interactive Physiology 2.0 tutorials, Dynamic Study Modules, Learning Catalytics, 3D animations, lab study tools, Get Ready for A&P, plus a variety of Art Labeling Questions, Clinical problem-solving activities, and more. Note: You are purchasing a standalone product; Mastering A&P and Pearson eText do not come packaged with this content. Students, if interested in purchasing this title with Mastering A&P or Pearson eText, ask your instructor for the correct package ISBN and Course ID. Instructors, contact your Pearson representative for more information.